Hydro Carbide manufactures tungsten carbide hot and cold mill rolls, flattening rolls, slitter knives, edge trimmers, scrap chopper blades, saws, guides and other parts suitable for use in tough mill environments and other metal producing industries. We make tungsten carbide grades which range in hardness from 93.0 RWA to 83.5 RWA. Hydro Carbide rings and rolls are produced in numerous sizes as large as 12 inches in diameter and up to 20 inches long. The materials are 100% dense and components such as work rolls are often finished to 1 RMS. 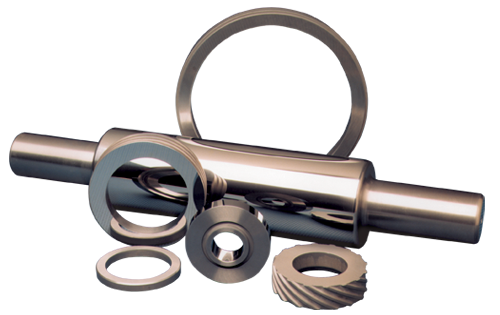 We also produce other mill products, including burnishing, capstan, rod mill, turks head, Koch mill, wire flattening and tube mill rolls.